Pablo born in Bogotá in 1950. He is an industrial engineer at Cornell University and a Master’s degree in Administration from the Universidad de los Andes. 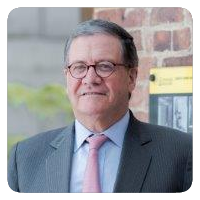 He was a Member of the Superior Council of the Universidad de los Andes from 1983 to 2011, several times Vice President and President between 1997 and 2003. He currently serves as Rector of Universidad de los Andes, a position for which he was elected in June 2011 . In his professional career he has worked, among others, as Vice Chancellor of the San Carlos School, founding member of Colegio los Nogales and manager of the Asociación Alianza Educativa. In addition, he was Manager of dairy products la Campiña and President of Global Education Group Colombia. He has been a member of numerous boards of directors, among them the Santa Fe Foundation of Bogotá and the Mario Santo Domingo Foundation. He is the author of the book The Journey of Frederic Edwin Church for Colombia and Ecuador, April-October 1853 (2008). The English version of this work was presented in Washington and New York and received very good comments from several specialists. In addition, he made the academic edition and compilation of the work Colombia in Le Tour du Monde (2013).